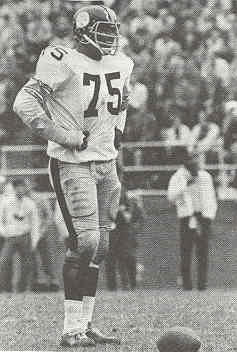 An All-American and considered the best college defensive line prospect available, even if comparatively unknown to most fans, “Mean Joe” was taken by the Steelers in the first round of the 1969 NFL draft (fourth overall). With his speed as well as strength, he quickly established himself as an outstanding pass rusher from the interior of the line. Steelers went 1-13 to finish fourth in the NFL Century Division. Greene’s outstanding rookie season was the first of eight straight, and ten overall, in which he was selected to the Pro Bowl and also the first of an eventual five in which he was a consensus first-team All-NFL choice while receiving at least some All-NFL or All-AFC recognition in four others. He was also chosen as NFL Defensive Player of the Year by the Associated Press on two occasions, following the 1972 and ’74 seasons. Greene became the cornerstone of an outstanding defense that was one of the highest-ranked in the NFL over the course of most of the next decade and the Steelers won four NFL titles. Fast, strong, and agile, he had the ability to dominate games and provided outstanding emotional leadership. He played a total of 13 years, all with Pittsburgh, and was inducted into the Pro Football Hall of Fame, Class of 1987.